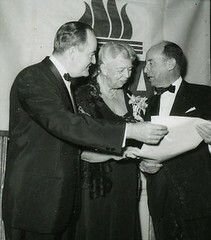 Americans for Democratic Action founders Hubert Humphrey (left) and Eleanor Roosevelt (center) with Adlai Stevenson (right). The Southeastern Pennsylvania chapter of the Americans for Democratic Action (ADA) held its membership meeting in First Unitarian Church. Guenevive Norton, chapter President, greeted the members and introduced Don Kusler, National Executive Director of ADA, “a voice for our causes in Washington.” Horton listed ADA’s recent activities, such as the campaign for earned sick leave, coalition work around voter ID legislation, merit selection of judicial candidates, endorsements for candidates in general and primary elections, and school funding and closing. Many of the other issues that we talk about are aided if you move forward on equality and fix some of the electoral issues we have…There are certain things we’re interested in at ADA nationally, but the most critical thing-the direction we’re heading in in our operations-is that Washington, unfortunately, is not currently a place where we can get much achieved. (Our politics) are so polarized, and our own voting records show this,” added Kusler. Referring to the “Liberal Quotient” score system of Congress-members, he said, “We’ve been doing it for sixty-five years, higher scores are liberal, lower scores are conservative. Over time, the parties, up until and in through the late ‘eighties and early ‘nineties, there was a lot of diversity in the scores; the Democratic caucus average was in the seventies, the Republican caucus average was in the thirties. They were solidly where you would think they would be. and that’s where (ADA’s) chapters come in. It’s so important that you (the members) find out what it is that grew (the chapter), what is it that’s your strength, what it is that you provide to the larger Progressive and Liberal community here is the Philadelphia area, that you can get behind, whether it’s an issue, or a couple of issues, or whether it’s a particular function of advocacy or information, I think it will strengthen both your membership, your contribution to the community, if you can do that as a group. That’s going to really provide an identity when we’re doing coalition work. The Pennsylvania legislature is going to do what the Pennsylvania legislature likes to do most, which is tell women how to live their lives. We have Senate Bill 3 coming up, which says that women cannot, if they buy health insurance through the exchange (set up under the Obama healthcare plan), buy (insurance) policies that cover abortion, even with their own money…I debated the chief sponsor of this on television, a guy named Don White, a pleasant enough guy, and he kept saying, ‘We don’t want taxpayer money going to abortions.’ That’s already the law. This does not do that, this goes a step further. Think about what the bill does. At the end of the day, it requires people who want coverage for abortions to buy a health policy through the exchange, and then go outside the exchange and buy a second health care policy that mostly covers abortion. What insurance company is going to offer a policy that totally covers abortion? Putting the issue of abortion aside, that’s how insurance works, spreading the risk over a large group of people for a variety of things. It’s like saying, ‘I’d like to buy an insurance policy that covers kidney stones,’ who’s going to do that? …Even if there was such a policy, what woman is going to go in and say, ‘I need to buy some abortion coverage.’ Most people don’t believe they’ll need that coverage, that’s why we don’t have individual insurance policies for individual things that can’t predict they’re going to have. It’s a crazy idea, and that’s what the Pennsylvania legislature loves doing. what I call the ‘ask your boss bill.’ This bill says that bosses can opt out of providing their employees, if it violates their conscience, with contraception coverage. If you’re a woman, and you want contraception coverage, you have to ask your boss’s permission. Think about the discussions that are going to result from that. which would provide mandatory paid family leave, for men and women. If you have a newborn, you can get twelve weeks of paid leave. This (kind of) bill is already law in almost all of the industrialized world. This is already a standard benefit of employment. This is already something that employers in Europe, Canada, and Mexico, and most of the world have figured out how to provide…It’s really good for everybody; it’s good for the kids, the rate of child mortality, (and) the rate of impoverishment all go down when you have that twelve weeks of bonding. JRAid is a new program of the Jewish Relief Agency (JRA), the food distribution program founded by Rabbi Menachem Schmidt, of the Chabad Hasidim. A brand new program…launched on September 18, 2011. The goal of the program is for our JRA volunteers to provide additional assistance and support to people in the community. It’s a way to go beyond just providing food support, but to help people with everyday tasks, (such as) changing light bulbs, doing minor home repairs, providing rides to the doctor, (making) friendly phone calls or friendly visits to home bound seniors, really trying to fill in the pieces, primarily for people who don’t have family or support networks in the area. The cool thing about JRAid is that it’s an online marketplace (for volunteers). As a volunteer, you register as a volunteer with JRAid, you tell us what you’re interested in doing, when and where you’re available to do it, and you sit back and wait for the system to come to you. You don’t have to search through endless lists of volunteer opportunities, our system does all the work for you. When a volunteer opportunity that matches your preference comes into the hopper, we send you an e-mail or a phone call, ‘It’s a match,’ and you can see whether or not you’re available to take advantage of the volunteer opportunity. We’ve worked with a few organizations, and directly with some families, for us to get volunteers, and we’ve mostly brought gifts for the holidays for those families, (such as) winter coats, hats and gloves and pajamas, games and DVDs, things to help the families be able to celebrate the holidays in a meaningful way with each other.